We're in for a treat on January 31st this year! Our full moon will pack a triple-punch as it's a blue moon, a super moon and an eclipse occurring in Leo. Let's break this down piece by piece. A blue moon is the second full moon in a single month and is said to emphasize the lunar qualities of the moon in terms of psychic awareness and receptive energy. A super moon occurs when the moon is at its closest to the earth, appearing incredibly full upon the horizon. This gives the moon an energy booster of sorts. Finally, the eclipse means that this moon will be a Blood Moon. Blood Moons are red, solar-powered moons full of fiery, projective energy. This Blood Moon will be particularly emphasized by the moon's position at 11 degrees Leo - a fiery, projective, solar-filled sign. Even more so, the sun will be in Aquarius during this time, creating even more of a counterbalance. A blue full super blood moon in Leo while the sun is in Aquarius (what a mouthful!) brings with it a spotlight on internal contradictions - that is, parts of ourselves that seem diametrically opposed yet work in perfect harmony. This moon hearkens back to the previous eclipse in August 2017 and implores us to explore what we've learned since then. What parts of us have changed entirely from who we once were? What closure have we found? How have we made opposites work together and where do we go from here? As my first full moon altar in many years, I was certainly feeling the pressure of such an important event but I didn't want to unnecessarily overload my altar. I kept the representations as simple as I could in order to avoid overwhelming the energy at play. I kept the overall color scheme simple: White represents the purity and receptive moon while gold represents the energetic and projective sun. Gold is also representative of glitzy, glam Leo the Lion in his full glory. I decorated the altar in gold, pearls and glitter just for him. Let's begin with the centermost point on the altar. This round, reflective mirror outlined in receptive pearls represents the moon. On top of it, I've placed a white and gold-rimmed lotus bursting open with the fiery energy of a tealight candle in the center. This represents the eclipse occurring at 6:52 am here in Kansas City, MO. Behind the eclipsed moon symbolism, I've placed my crescent moon candle holder with a long white taper. I use this candle holder for every full moon, so expect to see it on every altar with few exceptions. Beside the white of this candle, I've sat the "Cat-bernet Sauvignon" from Nyx's altar on borrow. The feline best represents the opposing energy of this moon: The domesticated, receptive and loving house cat as a partner to the owner and the big, wild lion on the prowl and leading the pride. The fact that Leo is a feline symbol enforces this even more. The pearly white and gold lions on either side of the altar are a direct reference to Leo the Lion. I've placed two to represent the second full moon of January. Funny thing about these little figurines: They're actually children's toys I found at a thrift store and spray painted white and gold. It's surprising how elegant they look despite being so quaint. In small containers next to each lion, I've placed a small offering representing the two major aspects of this moon. One container with red glitter holds a sunstone, a gemstone that exudes power and solar, projective energy. This obviously represents the eclipse. On the other side, I've placed a container with blue glitter and a moonstone which symbolizes the moon's receptive, psychic energy. This is an offering to the second moon of the month, the Blue Moon. It's unsurprising to me that, given the opposing forces at play, the feline-centric nature of this altar and the white and gold color scheme that Hermes, my communicative air familiar, would attempt to get in just about every picture possible. 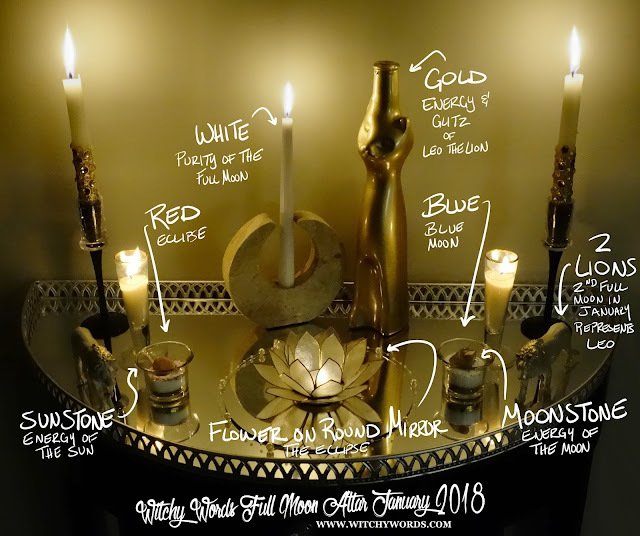 So there you have it - my first Full Moon altar since... goodness, 2013. I'll be continuing this altar series until I have 12 altars for show (and I may even continue it past then depending on how I feel about it). I'll leave you with a visual explanation of this altar in the meantime. Enjoy! Oh my goodness, thank you so much for all of your kind words! I can't tell you how much comments like this mean to me. I'm so glad I could help you on your journey! Best of luck to you and your furbabies! Thank you so much, Malik! I've become increasingly minimalist when it comes to altar work for that exact reason. I find that just a few items give a cleaner, more direct energy!